Modification to fix the low volume shutdown problem in the Memphis SA4.50 amplifier. I recently had a high-end audio system installed at Electronic Warehouse in my 2013 Honda Civic. The initial install included two Memphis Audio "Special Application" amplifiers model SA4.50. This amplifier unfortunately has a unique behavior... despite the 12 volt trigger being connected, the amplifier will not stay on during times of low or no input signal. The designers have combined "music sense" with 12 volt trigger, in an "AND" configuration as opposed to the customary "OR". This was undoubtedly a mistake as this behavior clearly makes no sense. Memphis had no known fix so unfortunately the two 4-ch amplifiers had to be replaced with a single 8-ch JL Audio. Later I disassembled one of these amplifiers to investigate the problem. Instead of using the music sense circuit to start the DC to DC power supply, the design used it to shut down the International Rectifier IRS2093M chip via pin 48 (CSD). I'm not sure what their thinking was here, if they had used the music sense circuit to start the DC supply instead, the amplifier would be able to work with decks that do not have a 12 volt trigger. The chip soft start needs only a single capacitor connected to the CSD to set the RC time constant, it doesn't need any external music sense. Clearly this just wasn't thought completely through in the design process. Hopefully in a later revision of the amplifier this will be corrected. By removing the surface mount resistor R27C, the music sense can be decoupled thus eliminating the problem. A red and green LED on the amplifier continue to function based on the status of the music sense but these no longer represent the status of the chip. With this modification this is a great amplifier, one of the best sounding compact class D amplifiers I’ve heard. 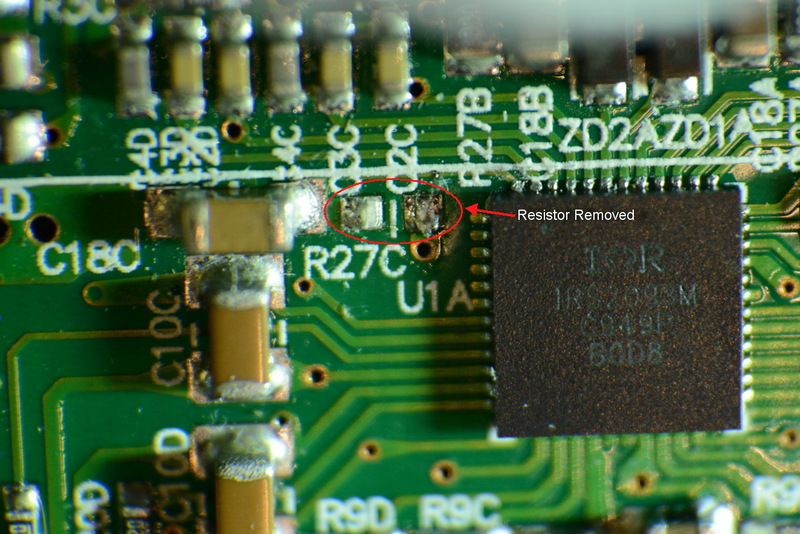 The R27C Resistor is a pull down resistor used to pull down the voltage on the CSD pin of the chip and hold it down until music signal is detected. The IRS2093M data sheet and application notes explain the applications of the CSD pin in detail. It is utilized by the chip for over current protection and to allow for a “soft start” thus preventing any “pop” in the speakers during turn on. 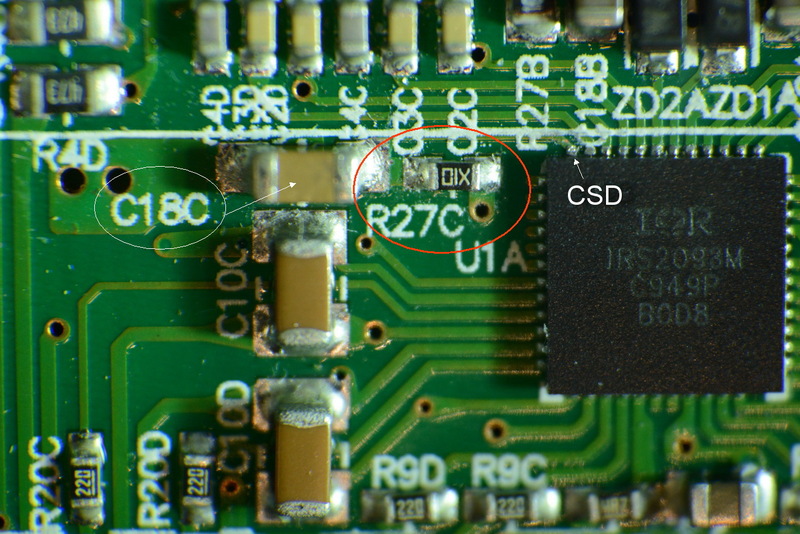 C18C sets the RC time constant for the soft start and no other connections to the CSD pin are required for the chip to work correctly. The use of this pin by the music sense circuit is simply an unfortunate design flaw. Once the R27C resistor has been removed, the music sense circuit can no longer shut down the chip and the amplifier behaves as it should. Prior to this I had not even heard of Memphis Car Audio despite their being in business since the 1960’s. If you are a car audio enthusiast you owe it to yourself to consider their products especially this line of compact class D amplifiers. I highly recommend the SA4.50 amplifier, it is very compact, runs only mildly warm and sounds great! Depending on your application you may or may not have issues with this flaw. If you never turn the music down, it will never be a problem. In my case I was sometimes using GPS with no music playing so consequently the first few seconds of any GPS voice commands were lost waiting for the amplifier to turn back on. The Memphis SA4.50 definitely sounds better than the JL-Audio. I didn't realize how much until I removed the JL and replaced it with two modified Memphis amps. The SA4.50 is quieter, cleaner and just overall sounds better. The modification isn't that difficult for anyone experienced in electronics but might be challenging for the average person. It may be best to take it to an electronics shop to have it done. Also, keep in mind this likely voids the warranty which is why I have been buying these cheap on e-bay. (no warranty to void). I’ve also pulled the 4-ch JL-Audio out of my F150 truck and will replace it with an SA4.50. That system is completely torn down at the moment, I’m completely redoing the wiring and installing a JVC Navigation deck like the one in the Civic.